The NET232+CC is a serial to Ethernet device server, especially designed for use with equipment following the Cisco® RJ45 console port pinout. 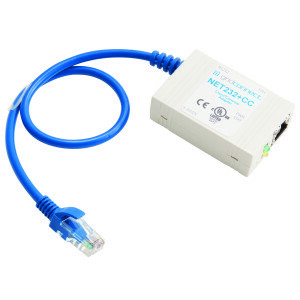 The NET232+CC provides remote access over Ethernet TCP/IP to routers, switches, servers, and other equipment that have a serial RJ45 console port or management port. Any Cisco equipment that uses the Cisco 72-3383-01 (DB-9 to RJ45) Console Cable can use the NET232+CC. Examples of Cisco products that use this type of console port are the Catalyst® 2350 Series switches, Catalyst 6500 Series switches, and the Cisco ASA 5500-X Series firewalls. Other manufacturers use the same RJ45 pinout as the Cisco console port. For example, the IBM® Power 710, Power 730 and Power 8 Servers have a system port that can be used with the NET232+CC. The NET232+CC is simple to configure using the provided installation software and web page. Just connect the adapter to an RS232 based RJ45 Serial port and to the local Ethernet network and then run the free software to find and set up the NET232+CC. The NET232+CC is typically used to connect the console/management/system port over the network to a TTY console terminal program such as Hyperterminal. “Virtual” COM ports can also be created on a PC using the included Comm Port Redirector software. The NET232+CC can be powered from a nearby USB Port by using the optional “USB to Barrel Jack” cable. This cable simply takes the 5VDC power from the USB Port to power the NET232+CC. Power can also be optionally provided by a wall supply (US 110V or Euro 220V).